Posted on Wednesday, September 17th, 2014 at 1:19 pm. I could not leave Sedona without introducing you to Richmond, a culinary intern from the Philippines who is training at Enchantment Resort. Much like Kosta Cvoro, the student I profiled in my last post, Richmond is excelling in his training at Enchantment. I know this because he was just awarded Employee of the Quarter! He was nominated by the resort’s executive chef, sous chef, and just about everybody he worked with, it seems. This young man has made quite an impression here! Posted on Tuesday, September 2nd, 2014 at 1:55 pm. As I mentioned in my post from Rocky Mountain National Park, our national parks are a true treasure of this country. I had the wonderful opportunity to visit one of the most famous and widely visited parks – Grand Canyon National Park. Grand Canyon is one of the seven natural wonders of the world. This amazing gorge was created through tectonic uplift, erosion, and other natural phenomena – exposing stone half the age of the earth! Posted on Friday, August 29th, 2014 at 3:53 pm. View of Lake Huron and Mackinac Island from Fort Mackinac, built during the American Revolutionary War by the British. In this post, my colleague, Nadine Zaatar, shares her experience during a recent visit to Mackinac Island. Posted on Tuesday, August 19th, 2014 at 7:20 pm. Students visit to the White House! We regularly talk about the public diplomacy “multiplier effect” achieved through J-1 exchange programs. Exchange programs connect people around the world and link people through common interests, values, and passions. While U.S. designated exchange organizations – sponsors – implement individual programs, the State Department oversees the overall functioning of the Exchange Visitor Program and how sponsors conduct their individual programs. We ensure that the goals we seek to achieve through public diplomacy are fulfilled through J-1 sponsored exchanges. Route J-1 has allowed me to see for myself how that is happening in the area of volunteerism, a major focus area of the State Department’s public diplomacy mission around the world. Posted on Monday, August 11th, 2014 at 12:51 pm. My last stop on the second leg of Route J-1 was Lake Tahoe, CA. Lake Tahoe is the second deepest lake in the United States and it spans both Nevada and California. Here’s a fun fact: Did you know that if Lake Tahoe were poured over the state of California, it would still be 14 inches deep? Lake Tahoe’s initial attraction to hearty souls was its gold and timber resources; however, it’s now famous for skiing, hiking, and 274 days of sunshine each year. With this in mind, I joined a group of J-1 Summer Work Travel students for a day-long hike to Eagle Lake and Emerald Bay Beach. Posted on Tuesday, August 5th, 2014 at 5:17 pm. In this post, my colleague, Deb Shetler, shares her experience during her recent trip to South Dakota. Last week, my colleague Yupa and I had the pleasure of getting to know sixteen J-1 international students placed at South Dakota’s Custer State Park Resort as they participated in a community service activity. These energetic students spent a day supporting the state park in its effort to build a new amphitheater. Posted on Friday, August 1st, 2014 at 2:55 pm. I just visited Estes Park, Colorado, a beautiful little town that is the starting point for one of the best road trips in the U.S. – Trail Ridge Road. Trail Ridge Road is the highest continuously paved road in the United States, reaching an elevation of 12,183 feet. My Route J-1 road trip would not be complete without paying homage to this famous route, and the national park that hosts it, Rocky Mountain National Park (RMNP). Posted on Friday, August 1st, 2014 at 12:57 pm. 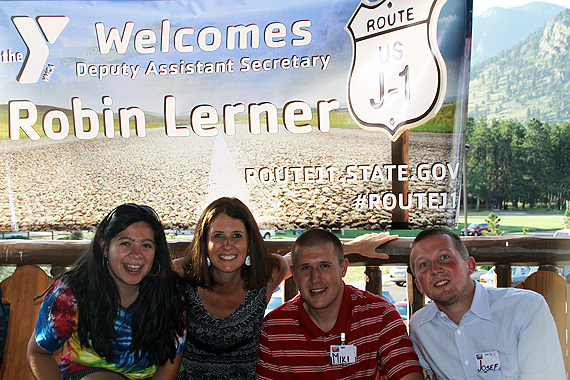 Route J-1 took me on an adventure to a faraway land where Robin Hood really exists – about two hours south of St. Louis! I visited Sherwood Forest Camp near Lesterville, Missouri to see some counselors in action at J-1’s Camp Counselor program. Sherwood Forest camp is a non-profit organization dedicated to bringing the summer camp experience to young people with few financial means. Posted on Wednesday, July 30th, 2014 at 3:54 pm. I spent my childhood attending YMCA after-school programs and YMCA summer camps, but I had never seen a “Y”, as they are sometimes called, quite like the one I recently visited on Route J-1. The YMCA of the Rockies is nestled next to Rocky Mountain National Park in Estes Park, Colorado.